After the fit, 40-something male cyclist made the enthusiastic comment to me above, I didn't know whether to be amused or offended. I doubt he meant it to sound demeaning, but it made me wonder more about him than about me! Just what impressed him?? It was a bit over two weeks since I'd run 75 miles at Across the Years but he didn't know that. 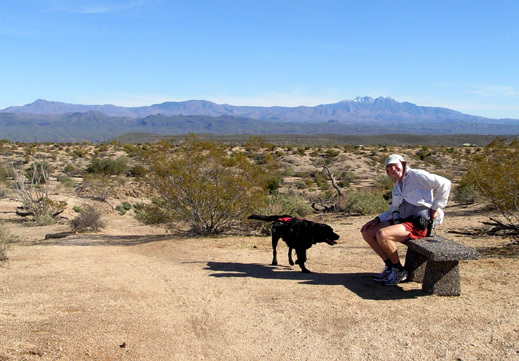 I'd already run two comfortable ten-milers on the trails at McDowell Mountain Regional Park and a total distance running and hiking of about 55 miles since the race -- but he didn't know that, either. I was about two miles into the run, feeling strong as I climbed up a gradual hill. I could see three cyclists coming toward me in the distance. When they got closer I stepped off to the side, had Cody sit, and said hello as the men rode by. They weren't kids, but they had to be ten or fifteen years younger than me. The last fella is the only one who spoke other than saying hello. I just smiled at his comment because he was gone in a flash, but I thought about it for the next few minutes as I ran along the trail. He saw me running for what, thirty seconds? 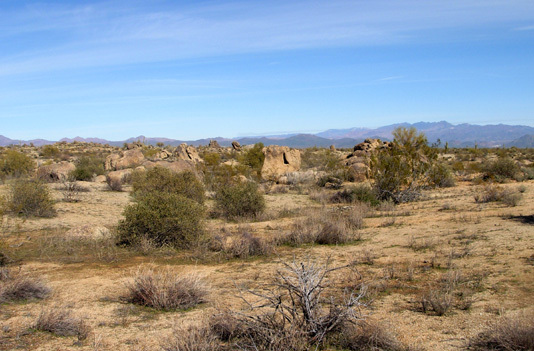 I was only a couple miles from the obvious trail head, not in the nether-reaches of the park. What's so impressive about that, I thought?? He must not see very many women running on this trail. Maybe he thinks I'm an old lady, although I certainly don't consider myself old!! These thoughts swirled through my head and I became a bit irritated. Then I'm afraid I got a little smug because of what he doesn't know about me, and I ended up simply being amused by the comment. I decided he was just clueless. If he knew, would he believe it? Likely not. My favorite running venues continue to be gnarly, hilly single-track trails through forests and up and down mountains but those aren't good for my deteriorating knees any more. 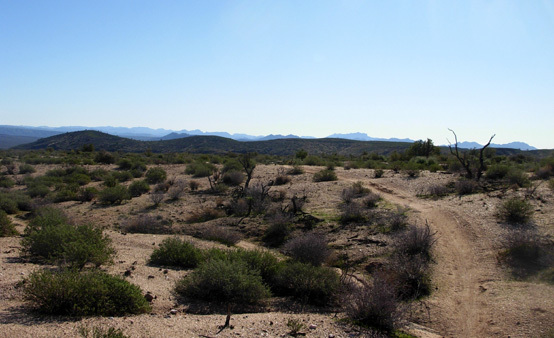 The undulating, mostly smooth dirt trails through the desert landscape at McDowell Mountain Park are almost perfectly suited to me, and I have been taking full advantage of them. The rest of this entry will be mostly photos of the various trails Jim and I have run and hiked the past seventeen days. 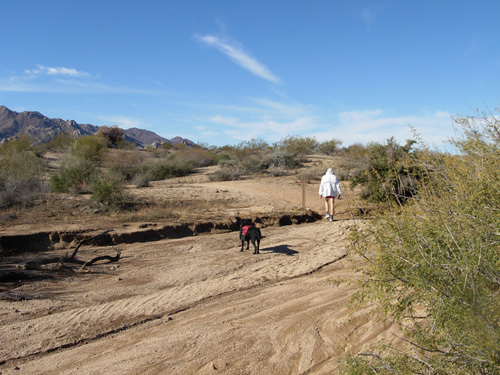 One or both of us has explored almost every one of the fifty-plus miles of trail in the park, some of them more than once. 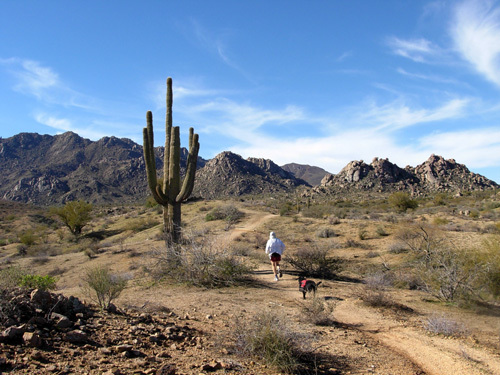 The largest loop you can see on the map is the 15.4-mile Pemberton Trail, which is the course that is used in the Pemberton 50K and Javelina Jundred ultras. Many of the photos I've shown so far are along the Pemberton Trail, which is multi-use. We saw more cyclists and equestrians on this trail than any of the others, even though they are permitted on most of the park trails. Everyone we met was courteous. The equestrians were especially friendly and I enjoyed seeing their beautiful horses. 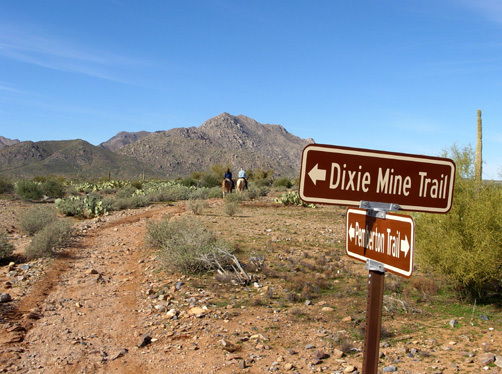 Several side trails bisect the large loop (Stoneman Wash, Bluff, Granite, and Tonto Tank trails), and others like the Dixie Mine and Scenic trails veer off from it, making for a wide range of possible distances. We did all sorts of various configurations and out-and-backs from our campsite and from the main staging area, quickly learning our way through the labyrinth of trails. 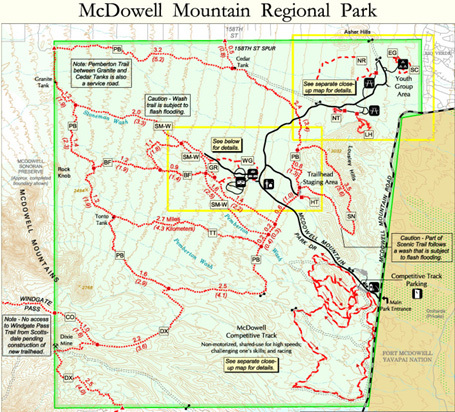 The trail system at the bottom right of the map is the Competitive Track for running (not hiking), fast and/or technical cycling, "galloping equestrians" and/or endurance riders, and official races. This weekend hundreds of cyclists are participating in several mountain bike races at this venue. There are three loops totaling almost fourteen miles. Jim ran there a couple times but didn't take photos. I never did get over there to run. 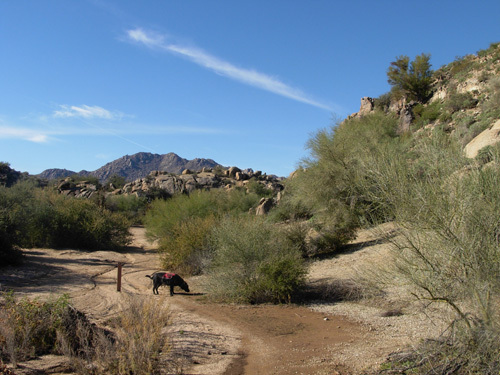 The newest trails are in the lower left corner: the Dixie Mine Trail (5.6 miles one way, including half a mile of paved trail outside the park boundary in Fountain Hills) and the Coachwhip Trail (one mile to the park boundary, more if you go up to Windgate Pass in the McDowell Sonoran Preserve). These trails have been added since we visited four years ago. During a long run Jim added distance to the Pemberton Loop by running several miles at the Competitive Track and doing an out-and-back on the Dixie Mine and Coachwhip trails. He says there isn't much to see at the mine. He didn't carry a camera that day either, and I didn't run or hike on those two trails. 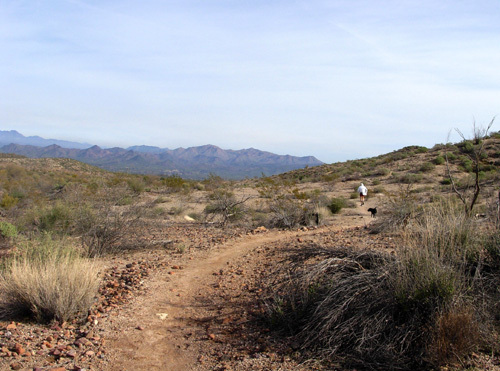 Other trails for which I have no photos are the Wagner Trail, a flat, smooth 1.1-mile trail next to the north loop of the campground; the 1.2-mile Lousley Trail, with excellent views of the Verde River; and the short Nursery Tank Trail, a wide, smooth trail that can be navigated with strollers and walkers. There are also Youth Group trails in the far NE corner of the park that are reserved for those groups. The North Trail, in the upper right corner of the map, is a well-groomed 3-mile hike-bike trail that we walked one day with a ranger-guided group. 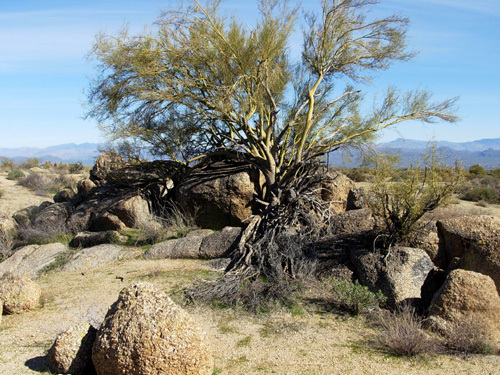 I'll show photos from that interpretive hike in another entry highlighting the flora of the Sonoran Desert. We ran this 3.5-mile loop clockwise but it's faster the other way, we decided. This popular trail intersects at two points with the Pemberton Trail just north of the main staging area. Two-thirds of it is fairly rocky, winding up and down and over the ridges of Lousley Hills. 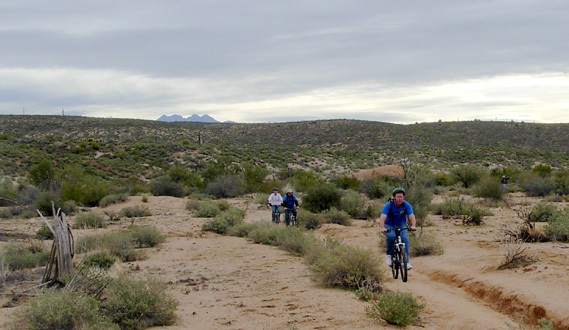 The other third is smoother trail through low desert terrain and across washes. Bikes are permitted but apparently don't use this trail as much as hikers and equestrians. 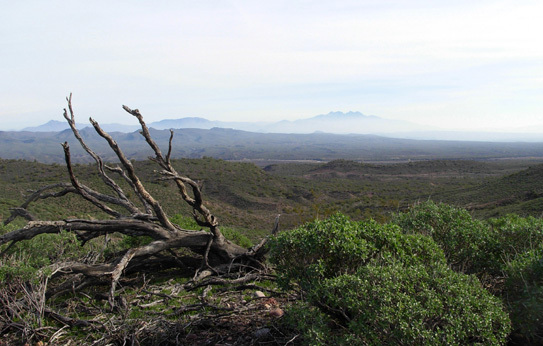 The views from the ridges are great, looking east toward the orchards and Verde River through the Fort McDowell Yavapai Nation and south to Fountain Hills. Then we wound down to the valley and back through the lower desert to the Pemberton Trail near the main trailhead parking area. The run totaled about 4� miles. 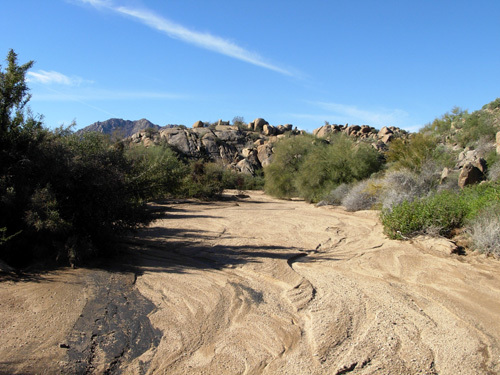 The 3.5-mile Granite Trail lies between Bluff Trail and Stoneman Wash, partially bisecting the Pemberton Loop. 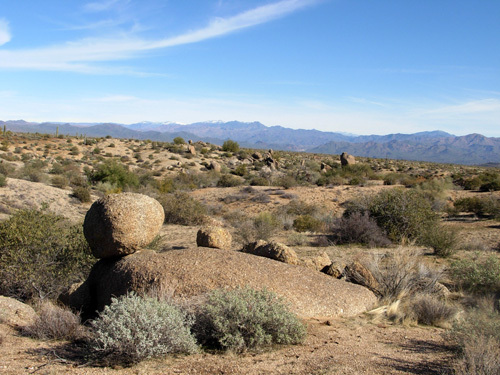 It starts at the eastern side of the Pemberton Trail near McDowell Mountain Road on the low side of the park and climbs gradually northwest, crossing the Bluff Trail, intersecting Stoneman Wash, then heading down into a gulch (arroyo) past interesting granite boulder formations. It loops through the gulch and ends farther west on the Bluff Trail. 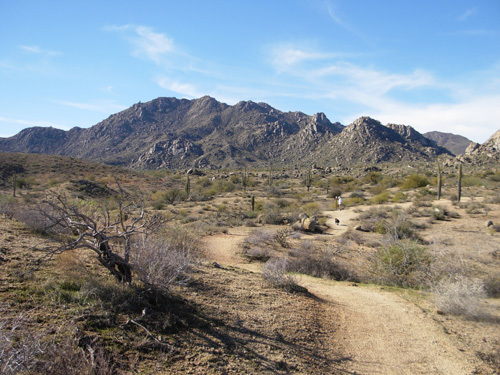 These trails measure 2.1 and 2.7 miles, respectively, bisecting the Pemberton Trail on ridges running generally east to west through the park. We used the Bluff Trail several times to connect from our campsite to the western side of the Pemberton Trail, a gradual uphill trek out and downhill back. 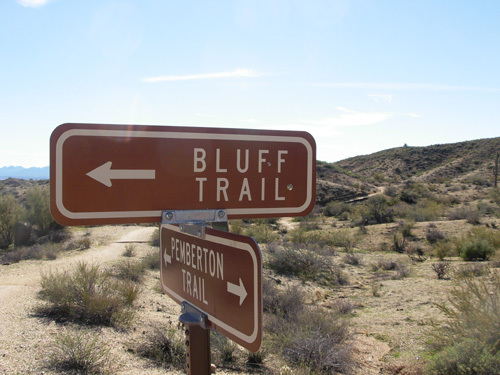 The Bluff Trail is smoother than the Tonto Trail and is fun to run, especially back down toward the campground. Warning: cyclists really whiz down that descent, too. 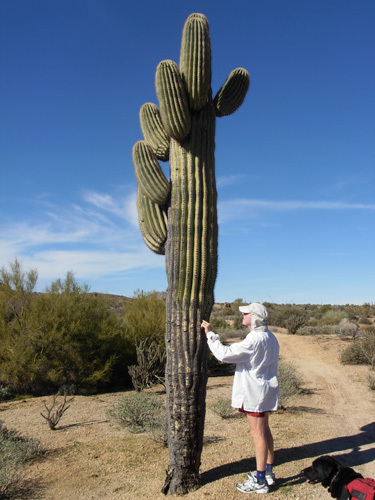 Jim inspects an old Saguaro Cactus, which grows only in the Sonoran Desert. 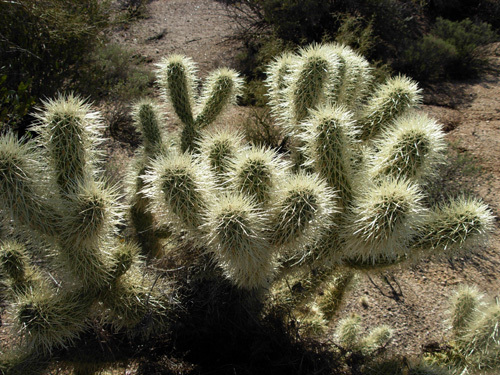 Teddy Bear Cholla, a type of cactus, looks soft but it has very sharp spines. 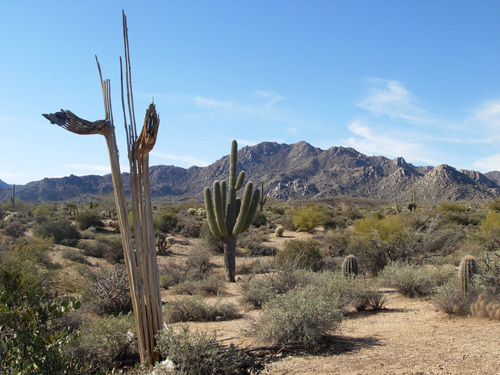 Spines of a dead saguaro in front, with a multi-armed sentinel of the desert behind. That's the McDowell Mountain range in the background. Jim and Cody head up the Bluff Trail toward Rock Knob. What a beautiful day!! Looking south on the Pemberton Trail from the intersection. In order to keep these entries at a reasonable length (and in deference to those with slower computers or internet connections), I'll showcase the Pemberton Trail in the next photo essay.